Turrón is a very old, traditional sweet of Moorish (Arabic) origin. It has been a popular sweet for centuries, even outside Spain’s borders. It is said that the Moors invented turrón over 500 years ago in Jijona, a small town about 30 miles or so north of Alicante. Jijona’s economy is still focused on the production of turrón, and there is even a museum of turrón that chronicles the process and history of the sweet. In addition, it is located within the factory that makes both “El Lobo” and “1880” brands of turrón. If you visit the museum from mid-June to mid-December, you can watch the turrón production from a balcony high above the factory floor. 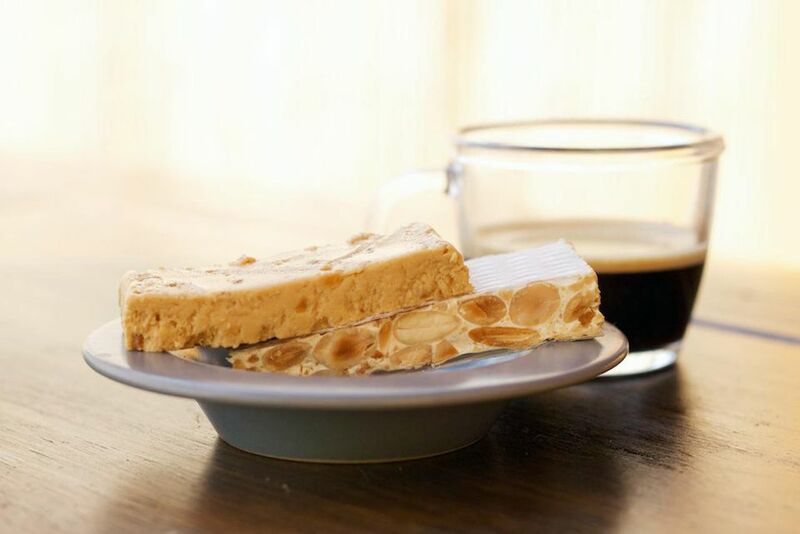 There are two traditional, basic types of turrón: soft Jijona or turrón blando, which is so smooth it has the consistency of peanut butter, and hard Alicante or turrón duro, which is like a thick almond nougat candy, similar to the texture of peanut brittle. Turrón is made with honey, and the wildflowers that bloom in the mountainsides all around the town of Jijona are food for the bees that produce it. The honey, together with the almonds from nearby orchards forms delicious turrón in the hands of artisan candy makers, called turroneros. In 1939 a Denomination of Origin for turrón from Jijona was created, and in 1991 the rules of the denomination were revised. Alicante or turrón duro is made by roasting, then chopping the almonds and mixing with honey. The mixture is then simmered overheat and stirred constantly with large wooden spoons. Egg whites are added to bind the mixture, and it is cooled. Once cooled, it is cut into pieces that resemble bricks, wrapped in a paper-thin wafer, sealed in plastic and packed. Jijona or turrón blando takes more work. Once the turrón duro is cooled, the blocks are ground up with almond oil to form a sticky paste. Then, it is reheated and beaten for hours until it forms a soft, even mix. Egg white is then added as a binding agent and cooled in square metal containers to be cut into thick slices and packed in plastic. The world of turrón is much larger than just Alicante and Jijona turrón. There are so many different flavors of turrón that it is hard to keep up. For example, new varieties include yema or egg yolk, praline, chocolate, and even kiwi! Rules strictly control whether a turrón may be labeled with “Suprema” or “Extra.” The best quality is “Suprema” and to wear that label, the soft turron must contain at least 60% almonds and the hard, 64% almonds. After that, there is “Extra,” “Estándar” (standard) and “Popular.” Most factories only produce turrón “Suprema” or “Extra.” The typical Spanish housewife will be looking for those words on the package label when she goes to the supermarket to buy for her Christmas dinner. Chocolate turrón deserves a little more description, not only because it is delicious, but because it too has qualities including “Extrafino,” “Fino” and “Popular,” depending on the percent of cocoa and milk it contains. It is made of from a base of cocoa butter, extracted from the cocoa beans. Some of the chocolate turrón also has dried fruits and nuts mixed in the center.